The students and staff at St. Didacus Parish School held their annual Fall Festival this past Saturday, bringing together not just those directly connected to the school, but also neighbors, graduates, and parishioners of St. Didacus Church. The crowd was big, festive, and really in the mood to show their school spirit! It was one of the biggest and most diverse events we’ve ever had. One of the biggest changes to this year’s festival was the long-awaited return of the individual class performances. 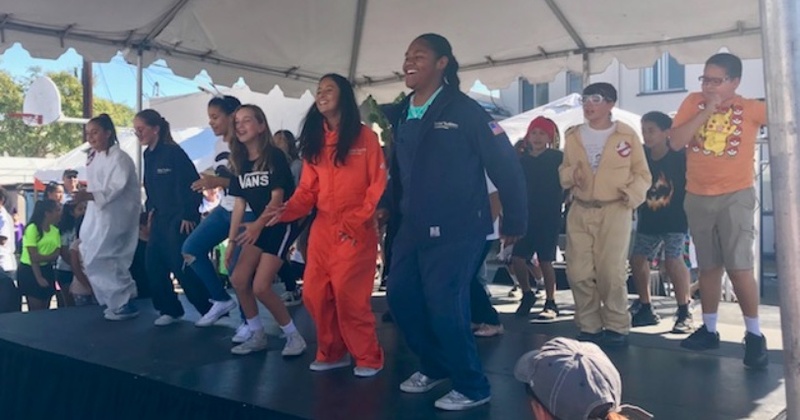 Starting just around 1:00 in the afternoon, each class took a turn on stage and performed a different song-and-dance act, patterned around this year’s Halloween theme. They danced and performed to such tunes as “Ghostbusters,” “Thriller,” “The Addams Family,” “Monster Mash,” and many other well-known numbers. Their hard work really paid off, from Preschool through eighth grade, as parents, friends, and neighborhood residents were all able to enjoy the show. Besides each class performance, there were also Irish musicians, line dancers, and the Baja Bugs. Everyone got to participate in a huge variety of games as well. There was a cake walk, several guessing jars, Plinko, Skee-Ball, photo booths, and even a live petting zoo, where kids and adults got to walk into a cage with live goats to pet and feed! The Giant Slide was also a big hit, where kids could enter an inflatable maze on one end, climb through obstacles in the middle, and slide out the other side. No Fall Festival would be complete without food, and we had plenty of it on Saturday. St. Didacus School is widely known for its diverse student body, and this was also reflected in the types of food we had available. There was a Taco Bar, a pizza stand, homemade meatball sandwiches, fresh carne asada with nachos, a fruit stand, and even a Lumpia booth, which highlighted wonderful dishes from Father Rick’s homeland in the Philippines. Such a treat! The kids also enjoyed cotton candy, popcorn, ice cream, and other tasty treats. The Festival continued until well after dark, with many people staying past the scheduled 8:00 closing time to enjoy the company and camaraderie. Many adults enjoyed the beer and wine garden too. To close out the day, the kids wore their light-up hats and necklaces and danced en masse before heading home, tired, but filled with the joy that comes with spending an entire Saturday with the St. Didacus School families.